Why Should I Worry About DNSChanger? How can I tell if my Computer has the DNSChanger Virus? I’ve got the DNSChanger Virus. What do I do? The DNSChanger computer virus is a piece of malware which has been around for several years now. It’s a trojan horse that covertly redirects your computer’s DNS (Domain Name System) settings to point towards rogue, criminal-owned web servers. These web servers display ads and forms which attempt to ‘phish’ for users personal information as well as generate illegal advertising income. DNSChanger originated from an Estonian hacker ring which was arrested for unleashing the computer virus last year as part of FBI Operation Ghost Click. 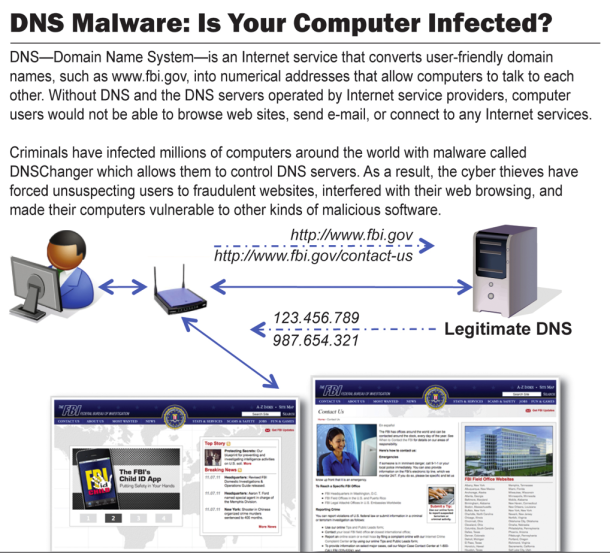 Despite this, the DNS Changer malware was so effective that it was able to infect around one million computers worldwide. Realizing that shutting down the criminal servers would effectively cut internet access for hundreds of thousands of people, the FBI created a ‘safety net’ which redirected the affected traffic to temporary surrogate servers. But as of tomorrow, at 12:01am EDT, the Internet Systems Consortium will be pulling the plug and shutting down these temporary servers. If your computer is infected with the DNSChanger computer virus, and you don’t remove it by Monday morning, you’ll be left without internet access. The easiest way to work out if your PC or Mac has been affected by the DNSChanger computer virus is to visit the official DNS-ok.us website. If you are based outside of the US, you will need to go to the website of the DNSChanger Working Group. If your computer has been infected with the DNSChanger virus, you’ll need to use the DNSChanger Working Group’s free tools and instructions to clear the malware from your system. If you have difficulty removing DNSChanger or have any particular concerns, contact your internet service provider for more information. Have you been affected by DNSChanger? Got any tips for cleaning out your system? Share in the comments below.